John Wells’s phonetic blog: gnot again! We know that really in words spelt gn- the g is silent (= there is no associated sound g): gnaw, gnarled, gnat, gnash, gnome. So I suppose we really should be saying nuː, or possibly njuː. But in serious discourse this animal is usually called a wildebeest (which we can debate whether to pronounce with w or with v). In even more serious discourse we can use its scientific name, Connochaetes (though the OED for some reason thinks it is Catoblepas). 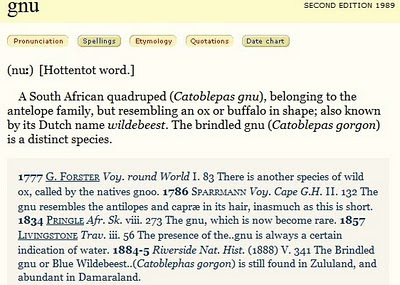 The etymology of gnu is given in the OED as “Hottentot word”. But in the Concise Oxford this is replaced by the slightly more precise “Bushman nqu, probably via Dutch gnoe”. Neither “Hottentot” nor “Bushman” is the name of a language in polite circles these days: the first we call Khoe, Khoekhoe or Nama, while the second term refers to any of a number of languages, including !Kung (!Xũũ) and !Xóõ. I wonder from which of the Khoisan languages, then, the word derives. The sports reporter on the Today programme (BBC R4) this morning was having trouble with the name of a racehorse, Abriachan. This came up at 06:25 and was followed by a brief impromptu studio discussion of what might be the correct pronunciation. An hour later, it was time to repeat the report, and I’m glad to say that by then the producer had tracked down the trainer of the racehorse, who was able to tell us all over the phone that it was named after a village in the Scottish Highlands, pronounced əˈbriːəxən. They could just have consulted Wikipedia. In fairness, even if s/he'd understood the improvised phonetic transcription at the Wikipedia entry for Abriachan, it would not have told him that the horse was named after that Scottish village. Surely the obvious thing for the Today programme to have done was consult the BBC Pronunciation Unit, that's what they're for. But I think it's admirable, though highly uncharacteristic, that a Radio 4 producer actually went to the effort of finding out how something should be pronounced. Normally the presenter would just make up some rubbish and move on. Ideally that research ought to happen BEFORE it was time to say the word on the radio, but better late than never. I may have got it wrong, but my understanding was that the producer and presenters tool interest only because the news-reader on duty objected to the first attempt. Susan Rae is Scottish and recognised the pronunciation as impossible for a Scottish name. In Italian gnu is pronounced with a palatal nasal which is obviously a spelling pronunciation, as AFAICT there's no such thing in either Khoekhoe or Dutch (from what I gather from the Wikipedia articles about those languages). The Black Wildebeest (connochaetes gnou), a.k.a. White-Tailed Gnu, is/was known as !nu: in /Xam, one of the earliest-documented South Khoesan languages. It had similar-sounding names in other related South Khoesan languages, which are the ones the early Cape inhabitants would have been mostly familiar with. I'm amazed that OED still uses "Hottentot", btw. It would be like saying a word is a "N----r word". "The word Hottentot (when referring to the people, or their language) is generally considered both archaic and offensive; the word Khoekhoe (or a variant: see KHOEKHOE n.) is now usually used in its place." This is one of those rules that tripped me up. I never connected it to the similar knock, knight spellings, so for a long time I pronounced the gs as in Danish (at least to myself - I'm not sure I'd had opportunity to discuss the words). Thinking about it now, I'm sure I'm missing a pun in Lord Gnome and Gnome's Corner. Even though the picture above says "SECOND EDITION 1989", this is almost certainly pure unmodified OED1 text; the OED2, based on the Supplements, added only new words and new senses of existing words. The OED3 effort, which will presumably reach this word some time in the 2020s, is the first actual revision of the OED to be undertaken. 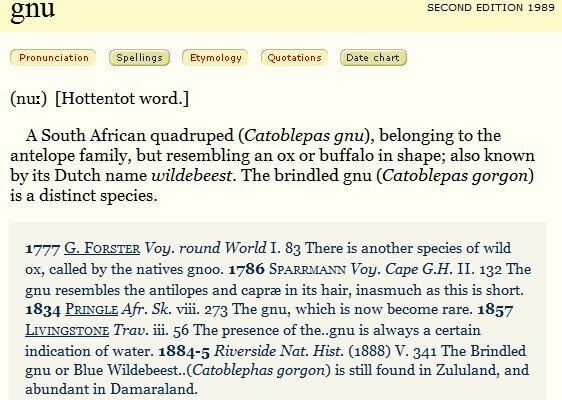 The OED's entry for gnu was published in January 1900 and doesn't appear to have changed since. As for the name of the genus, I note that the most recent quotation in the definition is an entry dated 1884-5 from a work called Riverside Nat[ural] Hist[ory] and that quotation includes the Catoblephas genus-name, so it's likely the editors took that as their source. Fooled me into reading ɡəˈnuːz. I have a childhood memory of a lion lifting his head, licking his whiskers, and saying the time is six fifteen and that is the end of the gnus. In Spanish, the animal is called "ñu", pronounced with the sound /ɲ/. Esperantlingva "fonologio" estante tia, kia ghi estas.